The Reserva Especial are hand rolled premium cigars, introduced by Jaime Garcia, son of the legendary Cuban cigar master Don "Pepin" Garcia. These high-quality cigars feature perfectly aged long filler tobaccos meticulously blended by Pepin Garcia's son, Jaime. Each Reserva Especial is carefully constructed using a dark, oily broadleaf Maduro wrapper by highly skilled cigar rollers at the Don Pepin Garcia's My Father Cigar factory in Estelí, Nicaragua. Stock up your humidors with these masterpiece premium cigars. 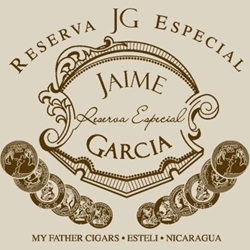 Every Jaime Garcia Reserva Especial offered here at our online cigar store can make a great gift for a family, friend or loved one. Smokers Discounts can bring a wide variety of premium cigars right to your front doorstep. We’ve made it easy and affordable to buy premium cigars online. A variety of sizes and flavors are listed below. Each of these styles are in stock and available for a low discount price! Call us for more details!